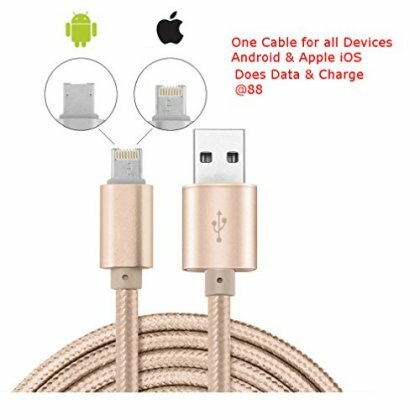 Universal Compatible Compatible with for iPhone 6s / 6s Plus / 6 / 6 Plus / SE / 5s / 5c / 5, iPad Air / Air 2, iPad mini / mini 2 / mini 3 / mini 4, iPad (4th generation), iPod nano (7th generation), and iPod touch (5th generation) with the latest iOS 9 and Samsung Galaxy S7 / S7 Edge/ S6 / S6 Edge / and other Samsung device, HTC, Motorola, Nokia, MP3/MP4 player, camera, hard drive, e-reader, external battery power bank, game console, and More Micro USB input devices. 100% Satisfaction Guarantee? No questions asked money back guarantee. Your satisfaction is our guarantee! If you aren't 100% satisfied with the item for ANY reason within 60 days of purchase, we will refund the full purchase price.